This is the third of the four films that make up the series, Mr. Coperthwaite: A Life in the Maine Woods. This beautifully shot and edited film follows Bill Coperthwaite as he prepares for winter in the woods. Wrestling with a large felled tree amidst its vast tangle of branches, Bill slowly and methodically breaks it down into expertly sorted piles of wood. He spends his days alone, tackling the great trunk with a cross-cut saw that once belonged to Scott Nearing. He works and rests, the gentle shifts of breeze and light hinting at the passage of time and the changing of seasons. In an unexpected moment, Bill reflects on the age of the tree and his own age. It serves as a poignant reminder of the span of life and the inseparability of man and nature. 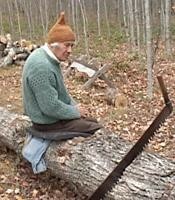 For complete information and reviews of the series, please see Mr. Coperthwaite: A Life in the Maine Woods. Use this page if you wish to order just this one title. Please go to the series page if you wish to order the complete series.